Dialogues between the Mesa de la Unidad Democrática (MUD) opposition coalition and the government yielded its first results this week. In the process the MUD seems to be regaining its leadership over the unruly forces of the opposition. On Tuesday government and opposition representatives agreed to expand the “Truth Commission” to include “recognized national leaders trusted by all” to be selected by mutual agreement. While they have not agreed upon the names nor upon the actual competencies of the commission, Vice President Jorge Arreaza suggested they would have the ability to carry out interviews and form their own conclusions. There was no agreement however, on an amnesty law for political prisoners. This was not a surprise as the MUD’s proposal called not simply for the release of those arrested over the last two months of conflict but for the release of all political prisoners arrested over the past fifteen years–including people like the Guevara brothers who were arrested for the assassination of Attorney General Danilo Anderson. The two sides did agree to a medical examination of Ivan Simonovis which could lead to his release on humanitarian grounds. There was also an agreement that the opposition would participate in “pacification plan,” the citizen security initiative the government rolled out in February. Ironically, Henrique Capriles’ willingness to dialogue with the government regarding issues of citizen security in January irked many in the opposition base as it symbolized his and the MUD’s softer line on relations with the government. Of course there is a broader irony involved in the entire dialogue process. The cycle of protests that began in early February were mobilized not only in opposition to the government but in defiance of the MUD. Leaders such as Leopoldo López and María Corina Machado while not openly breaking with the MUD were critical of what they saw as a complacent attitude and pushed for a more radical strategy. 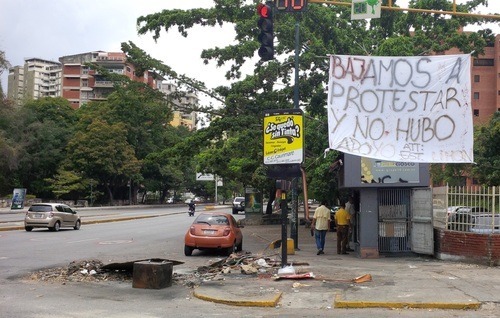 They catalyzed discontent among students in Venezuela’s autonomous public and private universities. The resulting protest movement eclipsed the MUD’s leadership for two months. What is more, MUD leaders such as Henrique Capriles have not hesitated to actively criticize barricades and violent “guarimba” protests. Yet the dialogues that began last week as a direct result of this protest movement, are mainly benefitting the MUD and seem to be drowning out the students and radicalized opposition base. Likewise students have refused to join the dialogue until four conditions are met, including: that a representative of the Episcopal Conference is included, the meeting be transmitted on national television, and only elected student representatives attend. With this last condition they are trying to avoid the government from including unelected pro-government students as it has on previous occasions. So far, however, there is no indication that the MUD is trying to find a way for these conditions to be met or for the students to be included in the negotiations. The students, for their part, are continuing creative protest events. However, for the time being the broader opposition base seems to have taken a pause in its support for protest as it waits to see if the dialogues bear fruit.